Q What are you hoping the audience takes away from the film? A I hope people are compelled by our depiction of The Duke and his plight, and will put pressure on the NFL to replace their focus on profit and popularity with actual support for its players who stake their livelihoods on the game they love at the risk of developing this disease. I also hope that audiences are entertained, that they feel tension, that they laugh and they cry, that they think about how messy life is, revel in the joy and pain of that, and also realize the value of family. Q How would you say this film tackles and brings awareness to concussions differently than Will Smith's Concussion? A CONCUSSION is very much about Bennet Omalu, the doctor who discovered CTE, his journey to realize the American dream, and how his battle with the NFL over his findings derailed that. 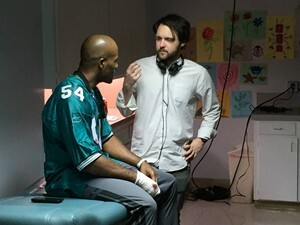 Our movie seeks to humanize CTE by placing the audience in the perspective of a man suffering from it. Through the character of J.P. Duke, we tried to communicate the confusion, the denial, the delusion, and the big ol' hearts of these NFLers suffering from a love of football they can't reconcile with a daunting life away from it. Q What's the process like creating a tragicomedy? A The tragicomic elements in the film stem from the emotional logic and journey of J.P. Duke. As a filmmaker, I'm very interested in exploring the grey areas of life, and with THE DUKE I was interested in this character who is a shade of his former self and must navigate delusions related to that faded glory. Tonally, I thought of it as having one foot in the grave and the other on a banana peel. Every aesthetic directorial decision started with the reality of the character in the moment. I was also excited by the challenge of creating a film that played like a football game, where a player suddenly gets knocked out, and we, as audience members, recoil in shock after previously relishing in entertainment. (This happened in the Super Bowl, two years ago, to Julian Edelman of the Patriots. At the time, nobody blinked an eye.) I wanted to put the audience in the position of falling in love with J.P. Duke and the setting and rhythm of the world, kind of seducing them with irreverent screwball energy -- this came naturally because J.P. is the proverbial "bull in a china shop," which posed endless comic potential -- before hitting them hard with the tragedy of Duke's situation. The very idea of NFL players battering their heads amidst America's cheers, the NFL turning a blind eye and hiding behind their greed, is inherently ironic and darkly absurd once you get past how sad it is. It's like we're rooting for our own demise. Q How long, from pre to post, did the film take to complete? A The film took about 10 months to complete from the first draft to a screening for cast, crew, and close friends. Q What type of crew and equipment were you working with? A Our crew was comprised of fellows from the American Film Institute. We shot on location with an Alexa and cut on Avid. Q Were there any specific film techniques you used to better tell the story? A We made the decision to shoot with anamorphic lenses (both Kowas and Hawks) in a 2:39 aspect ratio. We wanted to mess around with flares, to skew light and evoke J.P.'s sensitivity to it, and we also wanted to photograph this massive man awkwardly in a wide frame to pinpoint his distaste for suburbia and the dissonance of his grandiose self-image within that. The narrative is non-linear with two parallel realities unfolding, so we also had a lot of fun in post-production, finessing match cuts over time jumps and assigning impressionistic soundscapes to make sure the corresponding worlds linked while still remaining distinct. Q Why did you feel it was so vital to tell this story? A Besides the topicality of the CTE, I was interested in these NFL players being deemed washed up before the age of 35, having to start over and redefine their livelihoods so young. I played quarterback in high school, and while I was never diagnosed with concussions, the end of my career was incredibly difficult to come to terms with. You feel so many emotions out there on the field -- glory, despair, joy, camaraderie -- and then one day it's gone, almost arbitrarily so. For a long time, I bottled up my sadness. I'm not comparing my experience to an NFL player with CTE, but I'm able to relate emotionally because I can imagine how difficult the transition to civilian life is. Change is hard. Throw in concussion issues and it's incredibly hard. With THE DUKE, the idea of taking a behemoth of a man averse to showing weakness -- an American Gladiator, a warrior, the definition of macho -- and breaking him down to a place where he must confront his vulnerabilities seemed important, especially when most guys in the NFL shun doing so while knowing they're compromising their brains. Recently, you're starting to see more players retire on their own terms, and it's an incredibly bold decision to make. They're embracing that vulnerability.